mini-itx.com - what is mini-itx? Mini-ITX is a motherboard form factor created by VIA. 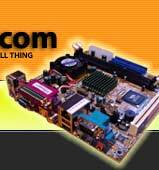 Motherboards are available from VIA under the name "EPIA". Mini-ITX and Mini-ITX-sized motherboards are available from manufacturers such as Axiomtek, Commell, DFI, Eyetech, IBASE, Insight, Lex, Lippert, Samsung and Unicorn. Mini-ITX motherboards are very cheap. But they are powerful enough to play back full screen video through their monitor or TV output. They are also quiet. The board above is an EPIA 5000, made by VIA. The CPU is cooled by a heatsink (i.e. a block of metal). There are no moving parts (i.e. fans) on this board at all. Other boards usually have small fans to cool the CPU, but are still very quiet, compared to a Pentium or Athlon fan. For more technical information - see the (in need of updating) FAQ, or just browse the site - you'll soon get the idea! Where can I buy one of these puppies? How about buying one from us? - we ship worldwide. That's us. An independent site featuring Mini-ITX related projects, information, news and stuff. Take a look around - you'll get the idea.